Brows our offer of clamps available in a variety of sizes and at affordable prices. Below you can find durable clamps suitable for any application, whether it’s for a home improvement project or for your on-site toolbox. If you’re looking for a reliable locking clamp that can be used in even the toughest industrial applications, take a look at our range of Milwaukee clamps for sale online. Perhaps the most popular type of clamp is the locking C-clamp as its simple and easy-to-use design makes it perfect for woodworking and metalworking. Our Milwaukee clamps have been manufactured from forged alloy steel for maximum durability and they have been designed with safety in mind. The thumb screw provides fast tool setup, more locking force and easier release. Swivel pads are available to provide surface stabilisation and to protect your work surface from damage. Explore the variety of benefits of using stainless steel clamps – they can help you distribute an even load, they enable long reach and fast action for your projects. Locking C-clamps can even provide you with a tool for one-handed use. With a vice grip locking C-clamp, you can have maximum clamping versatility, whatever the shape or surface you’re working on. Milwaukee's 'TORQUE LOCK' thumb screw provides fast tool setup, more locking force & easier release. The Milwaukee clamps are available in 280mm but can be purchased either with swivel pads which provide surface stabilisation and protects work surface from damage or regular pads which have a wide jaw that provides more clamping versatility on a variety of shapes and surfaces. Here at SGS Engineering, we only stock products from leading manufacturers. 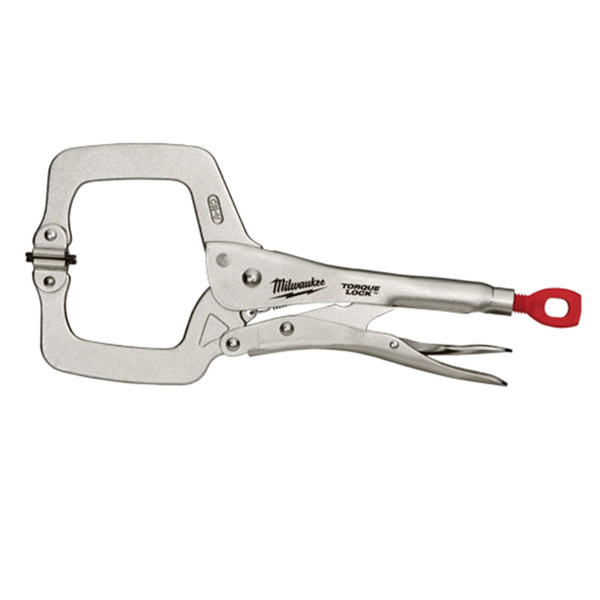 So, when you buy a locking clamp from us, you can trust that you’re receiving high-quality and reliable tools from a trusted brand like Milwaukee. Specially-manufactured for durability, safety and longevity, any tradesman or DIY enthusiast should make sure their toolboxes aren’t without a Milwaukee clamp. Buy online with us today so you can get that project started right away!